Catapult - Sell Your Music on iTunes, Apple Music, YouTube, Spotify, Google Play, AmazonMP3, Tidal, Rhapsody, Shazam and More! Utilize our service to sell your music online in all of the major digital music stores. 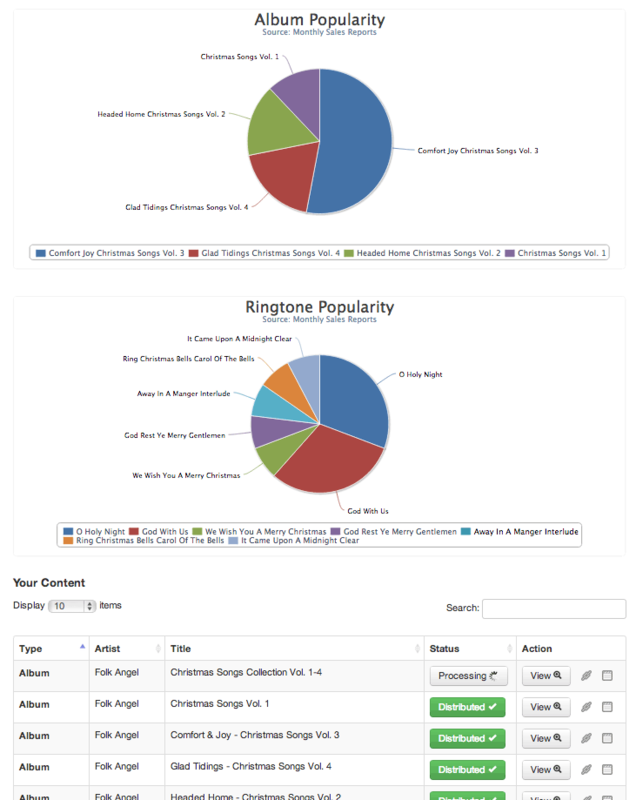 You can upload full albums, single track albums or ringtones with the push of a button. 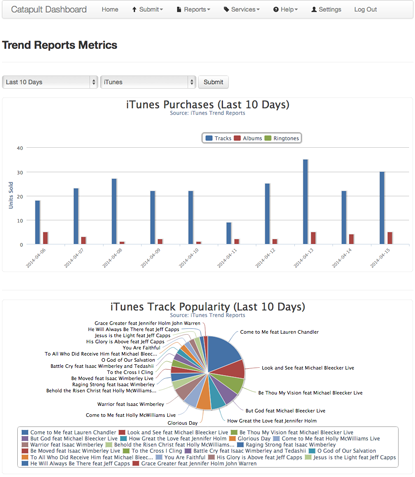 View daily sales locations from iTunes with our Daily Trend Report Subscription Service. 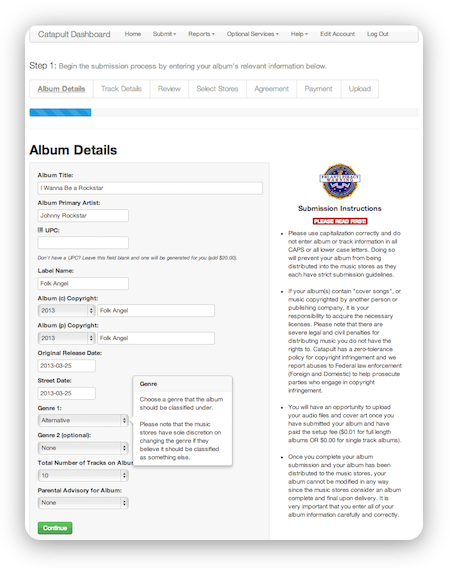 With access to your own Dashboard, you can submit albums, monitor sales with detailed reports from the music stores, and view all accounting information. Sell your music on iTunes, Apple Music, Amazon, Spotify, Google Play, Rhapsody, Pandora, Deezer, Tidal, YouTube and many more for as little as $9. Payments via PayPal with no transfer fees. Sell your music on iTunes, Apple Music, Amazon, Spotify and all other major digital music stores. Collect revenue from YouTube videos that use your songs. One time setup fees as low as $25 per album or $9 for Singles and Ringtones. 91% of all payouts from the music stores go straight to you. Choose only the stores you want your albums distributed to. 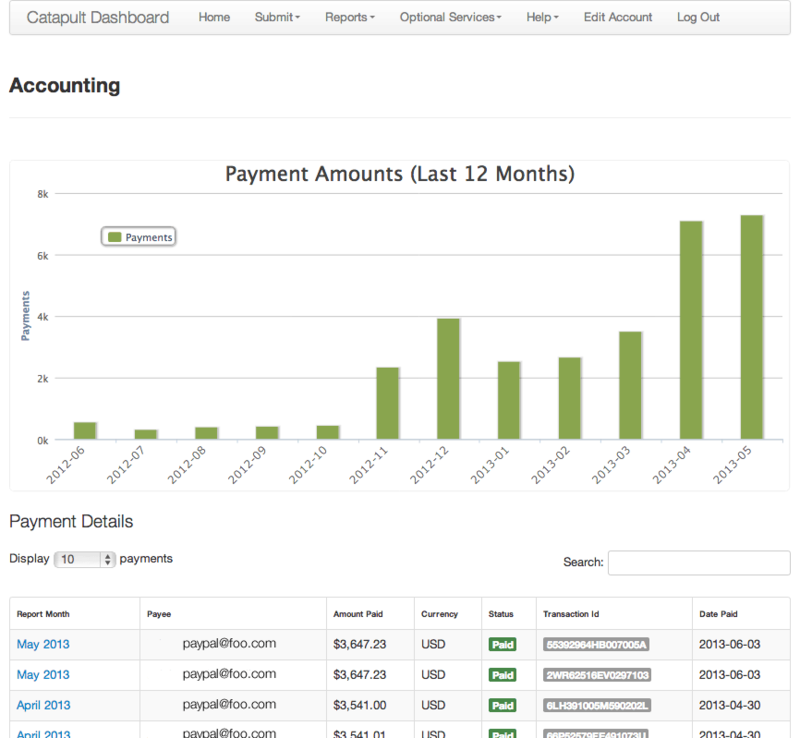 Payments every month via PayPal. 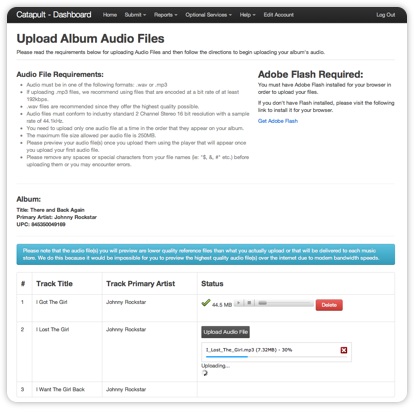 Upload your album's audio and cover art files. Your sales are automatically reported to Soundscan. Download Codes of your albums for your fans. No term lengths. The agreement can be terminated at anytime. Volume Discounts for labels or artists with large catalogs. Catapult is an approved aggregator for iTunes / Apple Music and all of the major music stores. We work with all artists and labels to quickly and easily deliver their albums and singles to stores around the world. Are you a label or artist with a large catalog of albums? Contact Customer Support to learn about our Volume Discounts!